Peace by Peace – Page 2 – We aren't gunna study war no more! I (mostly) love my day in Court! Well, things aren’t getting any quieter around here. 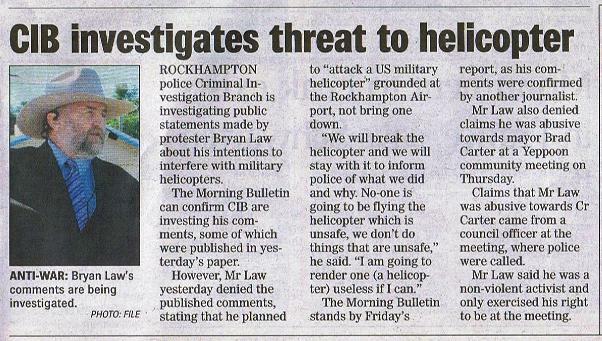 I was arrested by Rockhampton CIB on Friday and charged with “threatening an aircraft” under section 24 of the Aviation (crimes) Act. It’s an indictable offence carrying a penalty of up to 10 years imprisonment. I’m to appear in Rockhampton Magistrate’s Court on Monday 25 July, which is real good timing for me. 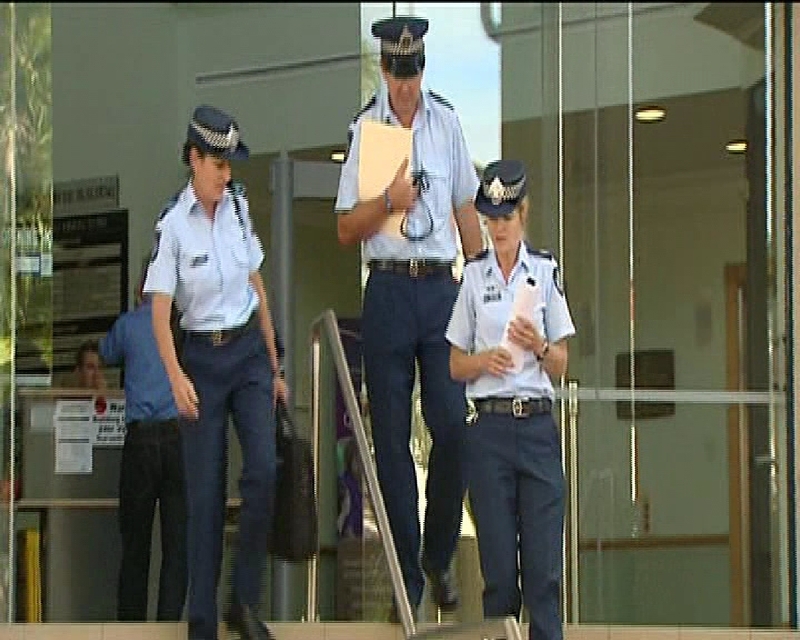 Margaret appears then too, in relation to her arrest last night. Yesterday was major fun at the people’s open day for Talisman Sabre. Police had an extensive presence aimed at controlling our behaviour, but the outcome gave us access to every citizen going in to the open day event. I dressed up in a tuxedo, a death’s head mask, and the Bob Katter Hat, and held aloft a copy of the maimed child that Jim Dowling made a focus of the Pine Gap actions. It was a real thrill to see how many citizens recognised and responded to my costume – and looked at the hideous picture. 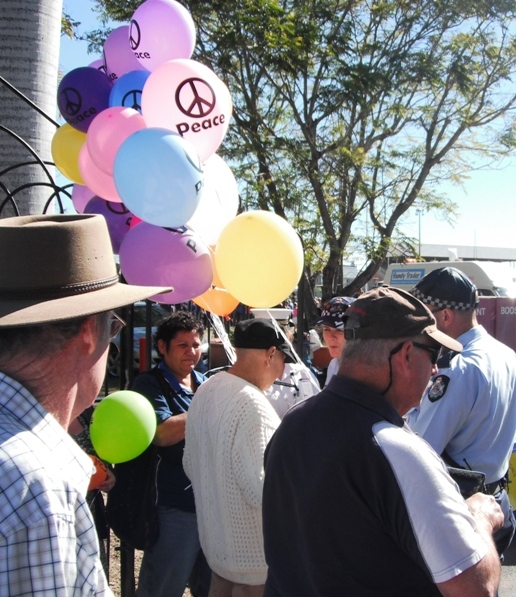 There was street theatre, peace balloons, participation from celebrated Darambul elder Jeanette Yoh Yeh, and a real good vibe as we put peace front and centre before war. 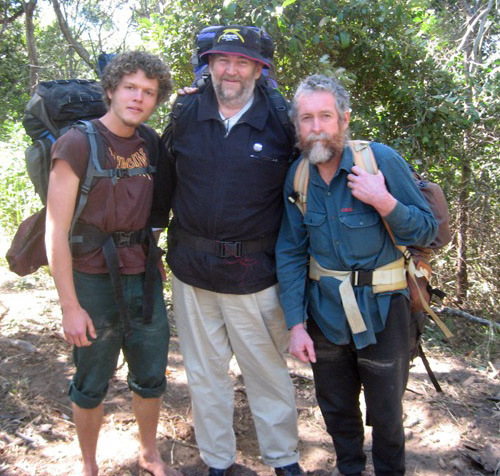 Jim Dowling was arrested for preaching the gospel, but was given a move-on direction rather than being charged. Hundreds and thousands of mainstream people, and they ALL got the message. 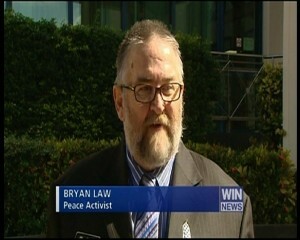 https://www.cairnspeacebypeace.org/?page_id=1194 We did some media too. So for me the prep work has achieved its aims. 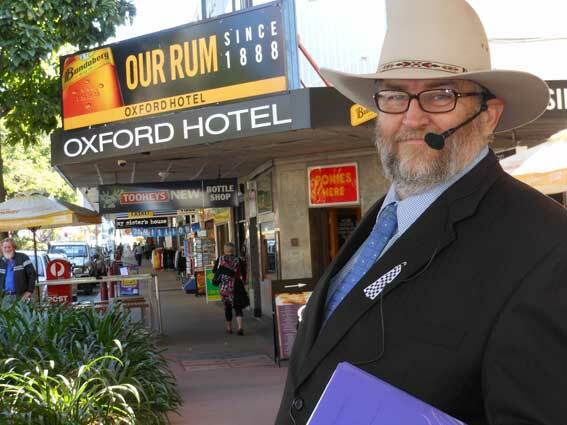 We’ve created a genuine presence and debate inside Rockhampton before the war-games start. Now we’re going to move on the direct action front. I just want to go to the ball. Things are going very well. Stay posted for more news as it breaks. Author bryanPosted on July 10, 2011 December 7, 2018 1 Comment on I (mostly) love my day in Court! How Hard R Helicopters 2get2? 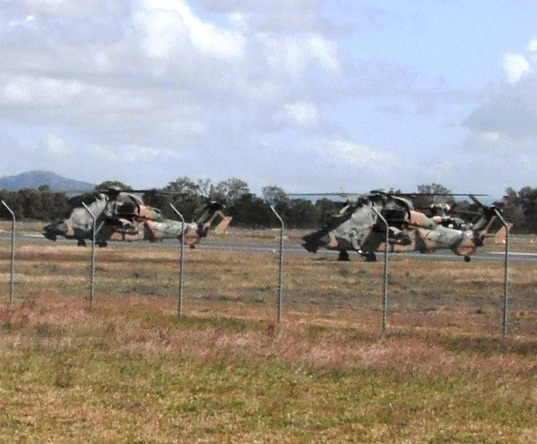 Australian military helicopters at Rocky airport 28 June 2011. Folks told me the US helicopters get here next week. I'm at the meteorological station here, with one fence right where I am, and then a second fence 30 metres away, then helicopters. 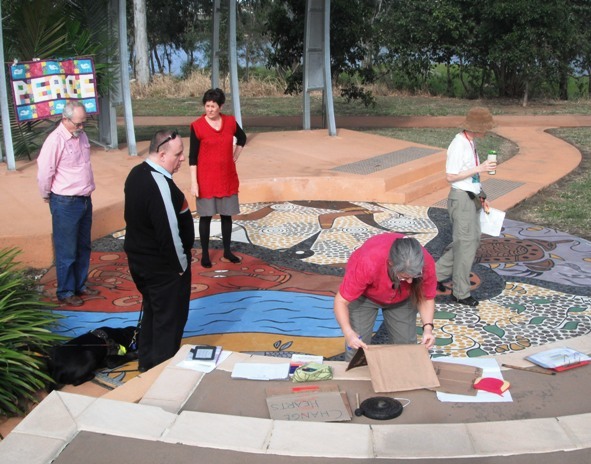 Catholic Peace & Social justice workers meeting in Rockhampton gather for a peace vigil. Peter arndt is standing in the left foreground. Police leave the courthouse after losing their application against me. In July, the United States military will conduct enormous training exercises in Australia with the Australian Defence Force. Warships, submarines, warplanes, and soldiers will arrive. Invading shores and villages will be practiced. Bombing from the air will be practiced. The U.S. war of terror continues. 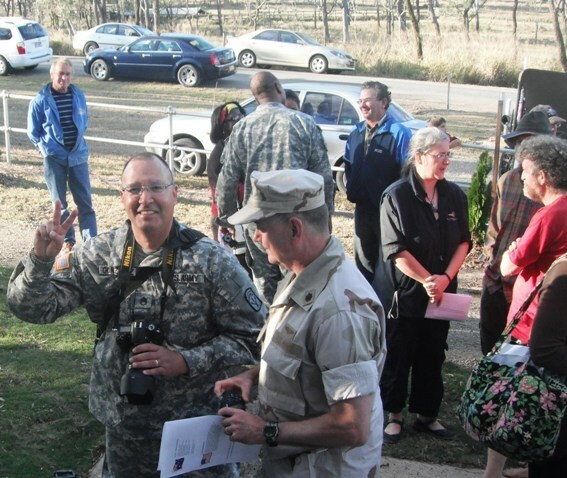 As I write, we are still at war in Iraq and Afghanistan and undeclared war in Pakistan, Yemen and Libya. Civilians are still killed and maimed by Coalition air-strikes. Civilian homes, schools, workplaces, infrastructure, and even weddings have been decimated by the U.S. bombs. These air strikes are a violation of human life, of international law, of morality, and the teachings of Christ to love our enemies. 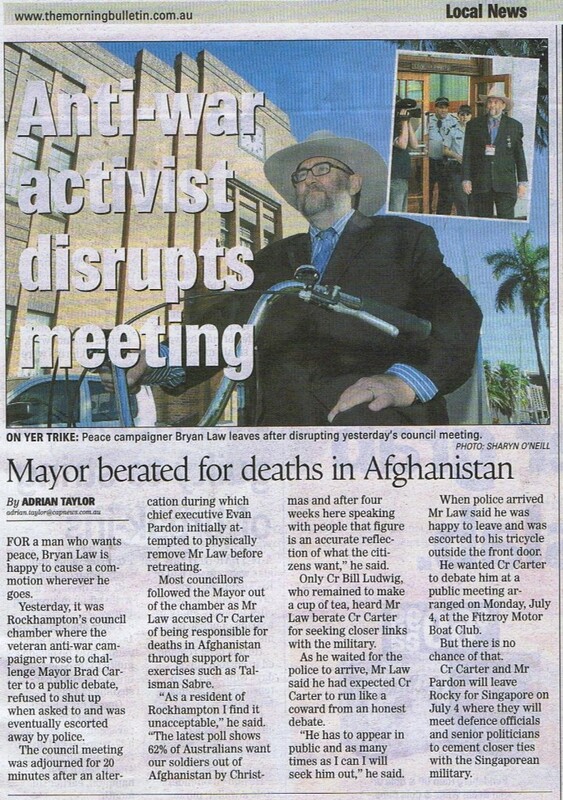 Celebrity peace activist Bryan Katter leaves this week's special session of Rockhampton Regional Council. 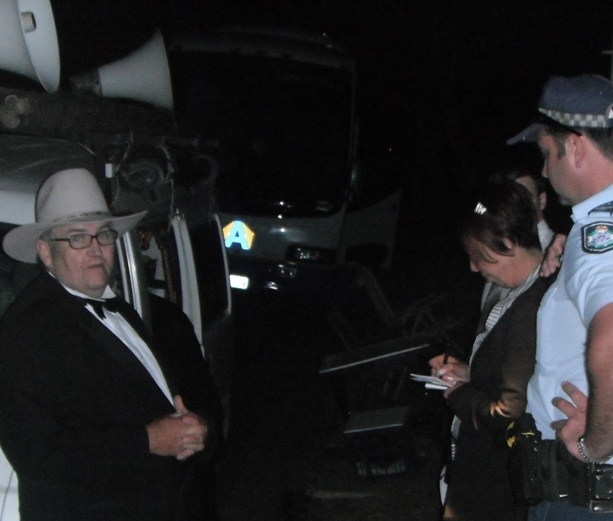 Mr Katter has been recently pre-selected by the Australia Party as its candidate for the federal seat of Capricornia. 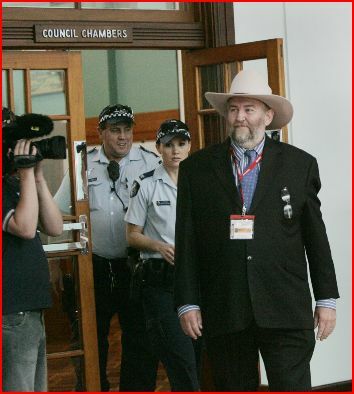 Mr Katter is considered a national treasure and Rockhampton Police inspector Mel Adams said nothing could be too much trouble for the coming generation of peace activists. Mr Katter will address a public meeting at the Fitzroy Motor Boat Club on Monday 4 July. The theme will be independence FROM America. 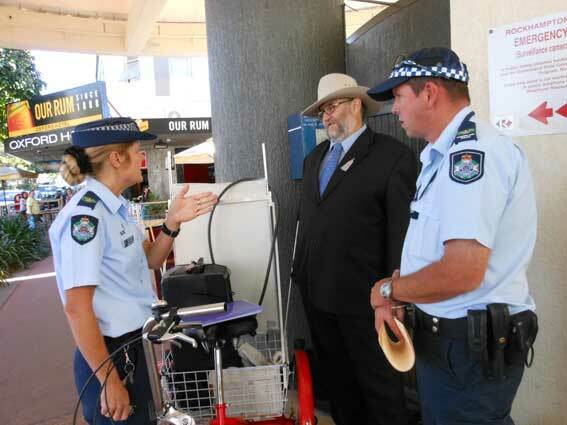 On Monday 20 June I was arrested by a rogue copper for spruiking on the East St Mall. 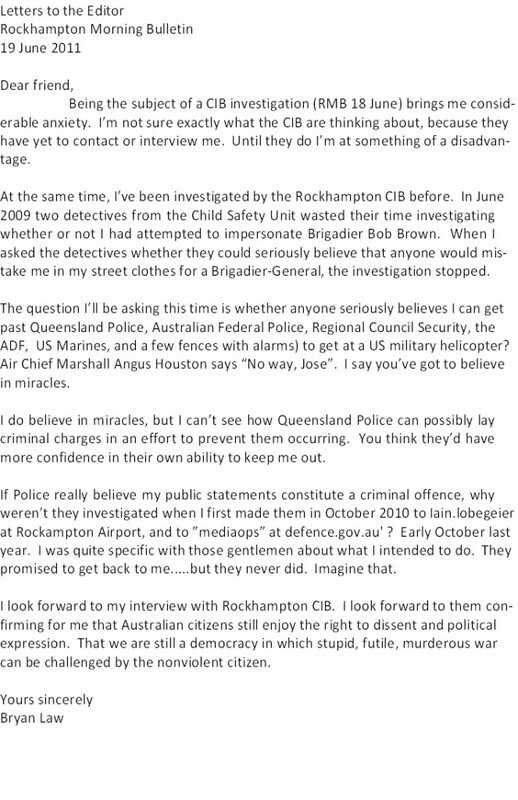 Three officers tried to bully and bluff me into moving on, but I was authorised by Rockhampton Police to be there, under the Peaceful Assembly Act 1992 and I stood up for my rights, then lay down for arrest. Read the Morning Bully story for a small pic of the arrest. On Wednesday 22 June I went back to the East St Mall, this time with Graeme and three media workers. Inspector Mel Adams and Snr Sgt Ewen Findlator came along to examine my set-up and negotiate with me. We agreed I had a right to be there. When they wanted to further restrict the conditions of my presence, we agreed they should seek orders from a Magistrate – according to the Act. Negotiating, but is it in good faith? Finally, getting on with it outside the Oxford Hotel (the publican wants me locked up. "Be patient" I tell him "It'll happen"). 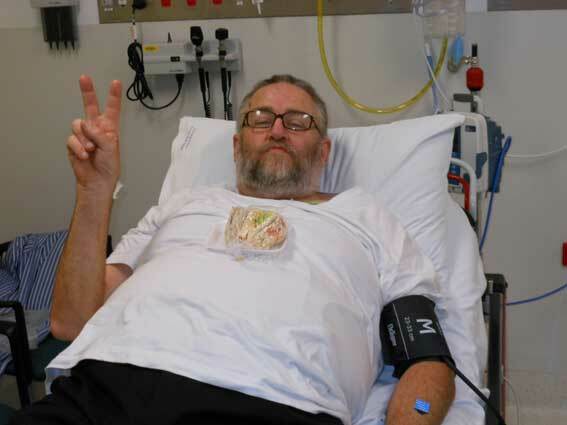 And finally, what happens when Police falsely arrest a seasoned activist. I hope this response is printed in a timely fashion. These texts appeared after I “stormed” the Council chamber and confronted Mayor Carter. The reactionary bunch has re-emerged! Hooray! The personal abuse is a bit of a drag, but the tactic of confronting a (deeply unpopular) Mayor will keep the story “hot” for the duration. The story on the right is inaccurate on several key points. I was never abusive. I didn’t threaten to “bring down a helicopter”. I calmy explained how I was gunna try and smash one that was already on the ground. I’m taking the matter up with Editor Fraser Pearce, and looking for a retraction. 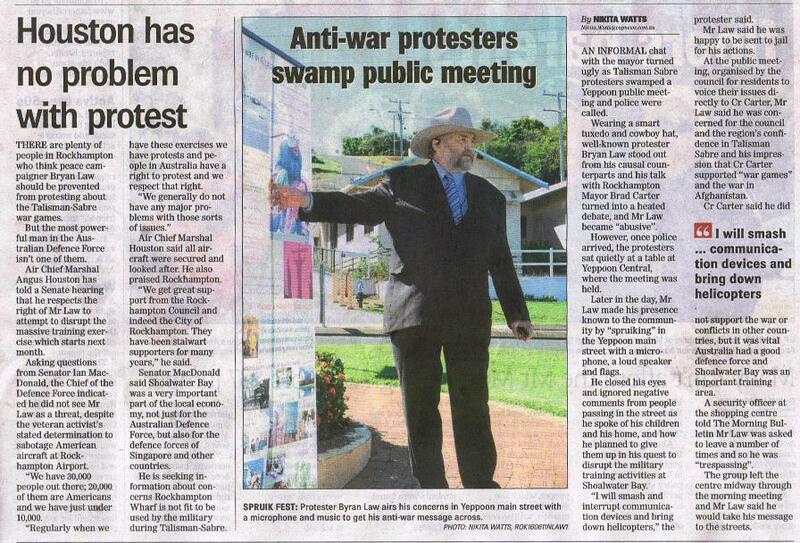 The story on the left comes out of the Senate Estimates Committee, courtesy of LNP Senator Ian McDonald. Felicity Hill of Scott Ludlum’s office alerted us to it. 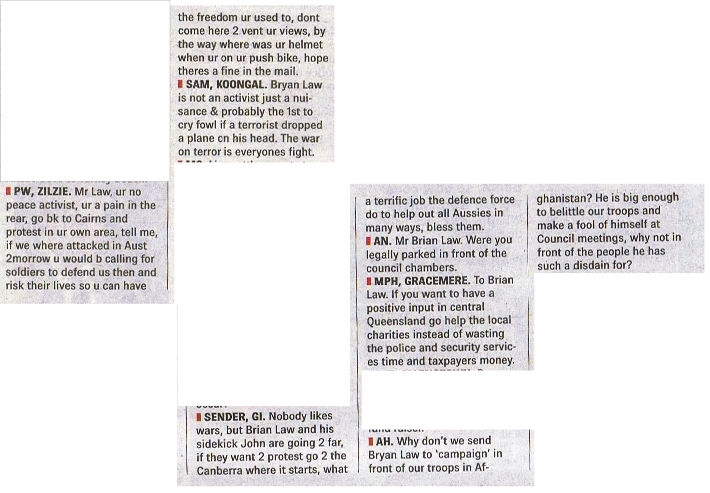 With Houston, Carter, McDonald and me all talking about Talisman Sabre and the war in Afghanistan – this might just be the beginning of a public debate.